After last week’s fuss, I’m so over Lana del Rey now. So over. All that “is-she, isn’t-she fake?” fuss is just so tedious, although here I am still yapping on about her. So, I’m going to focus on the one aspect that has been half-forgotten whilst her mostly-drab MOR pop silently grinds its way to centre stage: her big, deliciously over-inflated lips. Cor, look at them. They’re like big, kissable pillows on the front of her head. Yum yum yum. 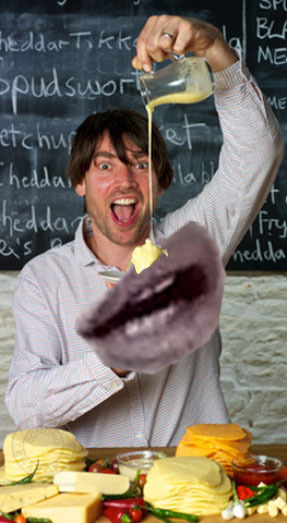 Alex James From Blur celebrates Lana’s lips in the only way he knows how. FIRST! What is Little Chestnuts‘ secret? They’ve managed to recreate a sound that I thought was, like Bill and Ted, trapped in time. However, they’ve ripped that spacious, reverb-laden style of guitar pop from the 80’s clammy grip and liberated it with happily shimmering results. SECOND! Bad Apes are totally my kind of band: they simply love their puns. Their EP is called… Gorilla Warfare. This song is called The Near Deaf Experience. Does it even mater what the music sounds like after that? Well, yes: and they make spazzy, hi-NRG, noize-yelp-rock. POW. THIRD! Souvenir Driver seem to specialise in music that drifts in and out of consciousness: both yours and their own. Like a conversation with someone who’s just woken up and is still half-dreaming, Touching might not make a whole load of coherent sense, but it’s lovely nonetheless. FINALLY: The Machine Room inevitably make mechanical music, although there’s a strangely appealing weft and weave in their music, where the strict rhythms bow to an indie sensibility, and vice-versa. A pleasant, epic-sounding curio. Posted on October 12, 2011 by Joe Sparrow. This entry was posted in Headline, Today's New Band. Bookmark the permalink.